I been hearing a lot about this book. Well, finally I got it and Reddit. I wish I had read earlier. It was written by the publisher of Success Magazine, Darren Hardy. 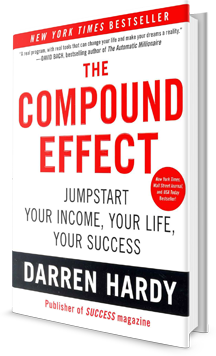 Long story short, this book explains how the miracle of compounding interest in money supplies to everything you do in life. This is one of those books that I will need to read once a month, Or at least a few times a year. it will be good to recommit, Maybe quarterly, To the principles in this book. Usually when I would hear somebody singing the praises of the compound effect by Darren Hardy, it is suggested that I read The Slight Edge by Jeff Olson as a companion to it. I am currently about two thirds of the way through the slight edge and will probably finish it today. When I started reading it I knew immediately why it is to be a companion to the compound effect. I will post a book review to the slight edge soon. I'm looking forward to graphically ministering for your company.